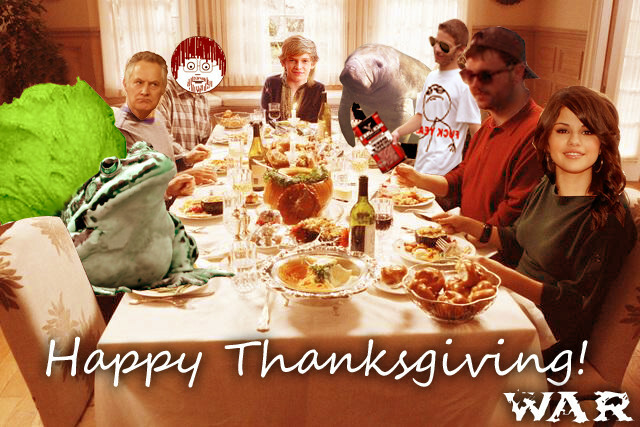 Forum / News and Announcements / Happy Warsgiving! Hope everyone gets full off turkey and other delicious meals. After everyone wakes up from their itis naps we should have a lil event at night, perhaps CS:S or if I can get the minecraft server back to its prime maybe that. Just go on Teamspeak around 10pm EST and we will do something for those of us feasting on leftover pie all night. Also in other news Zaifos is legal today. :megusta: Happy Birthday Zaifos. Everyone have a good one. I like how Bporr is the only member of the clan actually represented in this picture. lmao i like how even the goddamnit kar guy is there. and its the closest thing we have a to a pic of knights face so, it just has to count as him.